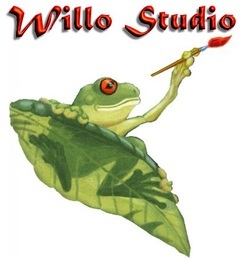 Sonya is the Managing Director of Willo Studio, an Australian freelance illustration studio specialising in botanical and wildlife illustration for print and digital publication in both traditional and digital illustration mediums. Sonya can produce illustrations in a wide range of mediums including digital, watercolour, oils, acrylic, gouache, pen and ink, scraperboard, pastels, pencil, charcoal, airbrushing and multimedia. Sonya's wide variety of illustration styles can cater for any illustration needs such as realistic, semi-realistic, scientific, taxonomic, cartoons, abstract, children's books, murals, miniatures, posters, books, artwork for exhibitions and laser animations. Sonya studied at the University of Newcastle, NSW Australia where she was the first to receive a Master of Design by Research degree in 2001 and has also graduated from a Graduate Diploma in Art (Wildlife Illustration) and a Bachelor of Arts (Wildlife Illustration) degrees. The University of Newcastle is home of the leading natural history illustration course in the southern hemisphere. "Choose Yourself 2015" exhibition at The Entrance Gallery. A wide range of artworks in many different styles, mediums and sizes by 13 local artists. Open 10am to 3pm. Last day Monday 11th May 2015. Enjoy. It's getting exciting at the Pop-Up Gallery at Westfield Tuggerah. We had lots of activity today with two workshops plus we had a NBN TV crew there today. They interviewed The CCC president Mark, Wyong Council and Westfield representitives, showed our artwork (you can see my artwork on the walls and my jewellery on the table), James and Remona creating art and my Mum and myself participating in Donna's storyboards workshop. We were on the news tonight. ©1991 - 2016 Willo Studio and Sonya Naumov. All images on this website are protected by copyright laws.